← Tommy’s comments on the reports of his death. I discovered a marvelous little collection of stories entitled Second Thief, Best Thief: Tunnel Bar by Anthony Olszewski. All of the eight stories take place in and around an inner-city tavern called the Tunnel Bar, just outside the Holland Tunnel in Jersey City. It’s a bar that does not have ferns. The author, a native born at the Margaret Hague Maternity Hospital in 1956, has unimpeachable credentials to speak for Jersey City. 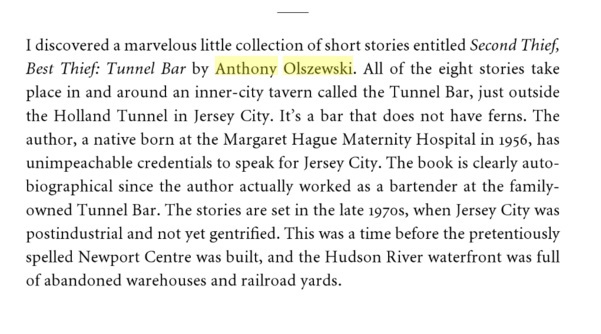 The book is clearly autobiographical since the author actually worked as a bartender at the family-owned Tunnel Bar. The stories are set in the late 1970s when Jersey City was postindustrial and not yet gentrified. This was time before the pretentiously spelled Newport Centre was built, and the Hudson River waterfront was full of abandoned warehouses and railroad yards. Olszewski’s short stories come out of a bartender’s oral storytelling tradition, so they are really miniature anecdotes that are quickly sketched and come right to the point. The stories are written in the hard-boiled style of Dashiell Hammett. The characters talk and act as real people do. The main customers at the Tunnel Bar are from the Jersey side of the Holland Tunnel — truck drivers, warehouse workers, and factory laborers. These regulars are supplemented by others who stop off after traveling through the tunnel from time to time. Late one night a belligerent wino, upset with the tavern owner’s “attitude,” threw a brick through one of the panes of glass. The hole was boarded over and — since the glass was never replaced — remained so. In an attempt to prevent burglary, metal bars from a scrap yard were bolted behind the intact glass in the one window and behind the plywood covering the space left by the other. After decades of cigarette smoke, a layer of yellow tar covered everything except for the rows of shiny bottles on the counter behind the bar. Through the narrator we meet the gin mill crowd, an interesting cast of characters. There’s the homeless James O’Leitnin, who hangs out at be bar, seated by the phone. He takes it on himself to answer the phone on a basis, “having assumed the imaginary job of bar receptionist.” Then there’s a big ex-convict named Hal, who, at six feet four inches and 260 pounds, intimidates any who might argue with him. In the old days, Hal’s specialty was armed robbery, but now he’s content to do enforcer work for loan sharks and bookies. Reading this collection of short stories set right outside the portal of the Holland Tunnel on the Jersey side, we get the feeling that anything can go wrong in this dingy spot. This entry was posted in The Tunnel Bar. Bookmark the permalink.